Ramdoo, I. 2014. Economic transformation in Mauritius. GREAT Insights, Volume 3, Issue 5. May 2014. In less than fifty years since its independence, Mauritius has managed to trace a remarkable development path. Yet, at the time of independence, all the conditions were gathered to meet the predictions of the prophets of doom. A small vulnerable island, deprived of any natural resources, flanked with a monoculture economy, high unemployment, low education and low income, amongst others, were more a recipe for disaster than that of a success story. Despite that, time, leadership and vision not only proved that another outcome was feasible, but more importantly, that profound transformation was possible, and all that within one single generation. The experience of Mauritius brings useful insights into the dynamics and pitfalls of an economic transformation journey. Where did it start and where is it going now? In 1968, at the dawn of its independence, Mauritius was a sugar-based monoculture, with a stagnating GDP per capita of barely US$200. 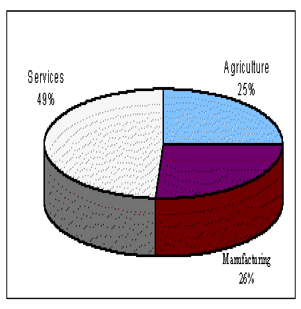 Agriculture made up 25% of the gross domestic product (GDP), as shown in Figure 1, and sugar alone accounted for over 90% of total exports. Unemployment was rampant, estimated at 20%. Today, the contrast is striking: the economic landscape is completely transformed. GDP per capita is estimated at slightly above US$8,000, and the country has a diversified economic structure oriented towards services, with numerous contributing pillars, as illustrated in Figure 2. 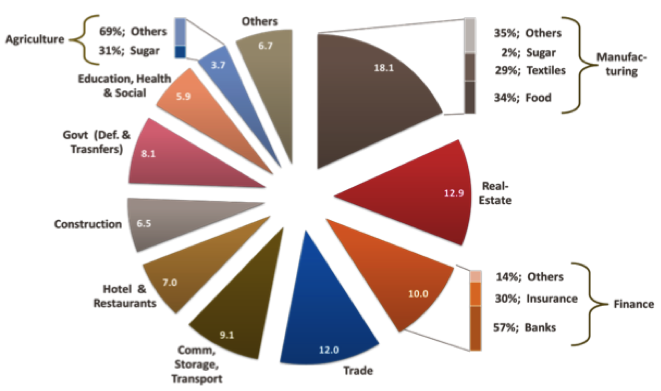 Agriculture accounts for less that 4%, of which sugar barely accounts for a third of sector contribution. The financial services sector has taken much prominence in the last decade. With its 21 banks, 26,096 global business companies and 905 global funds Mauritius is positioning itself as a financial services hub and gateway to Africa . Societal transformation was not neglected. At the time of independence only 1 out of 3 children was enrolled at primary school. Today, this rate has reached 99%, and the government is now pursuing the policy of “one graduate per family”. Access to safe water and decent infrastructure were real challenges. This has now been largely overcome. Life expectancy has improved, transmittable diseases have been eradicated and only 1% of the population live in absolute poverty. ‘Economic’ transformation was conducted in such a manner that the economic landscape, society and institutions were modernised simultaneously, though at various speeds taking into consideration the political, human, institutional and economic realities and constraints of the time. The approach was largely inclusive because the major asset was the population. On the economic front, it translated, in a nutshell, in what Figure 3 captures: systematic restructuring of the economic base through a broader sectoral focus and at the same time, a deeper focus on specific sectoral activities where there were possibilities to upgrade production. Today, the economy is more diversified, institutions are in place to support the continuous need for change, and policy making is participatory, with a decisive role for the private sector and representatives of the civil society. There are certainly a number of challenges that still have to be addressed. Skills mismatch resulting from economic re-engineering, remains a major challenge, in particular for those involved in low-productivity jobs. Income inequality has widened significantly over the years, especially between modest households and the constantly increasing upper middle class. While Mauritius has a basic system of social safety nets in place to insulate the most needy from absolute poverty, this does not meet the requirements of a rapidly changing society. In the health sector, the country has one of the highest rates of diabetes in the world, and non-communicable diseases are probably the most widespread pathologies. That said, the Mauritian story is based on five foundational stones: political leadership, strong institutions, its ethnic diversity, a class of indigenous entrepreneur and a well structured private sector that is engaged in regular dialogues with the government on policy matters. Coupled with this, the transformation has always ensured the balance between economic and social objectives, notably with a strong focus on human capital, through free education and health, and a minimum basic social safety net for the most vulnerable. Mauritius suffered the setbacks of a major economic crisis at the end of the 1970s. Like most crisis-ridden developing countries of those days, Mauritius sought financial support from the International Monetary Fund (IMF) and the World Bank. But bailout loans had a painful counterpart: the implementation of a structural adjustment programme (SAP). Of the SAP, the government kept only those measures that were necessary to address macroeconomic imbalances. The remaining prescriptions, in particular regarding social expenditures, subsidies, trade reforms and state-owned enterprises were undertaken in a sequenced way that fitted the Mauritian reality of the time. The crisis had cost the government of the time seats in Parliament and the newly elected leader made decisive policy choices that were hard to swallow but finally paid off because they profoundly reformed the Mauritian economy. Indirect taxes (i.e. sales tax) were introduced to finance the fiscal deficit and cautious wage policies were adopted to maintain export competitiveness. The politically sensitive sugar sector was restructured through centralisation of mills and expanding labour participation in the ownership of factories. The government finally won the battle of ideas over ideology because policies did not follow any conventional wisdom but were instead heteroclite and adaptive. Solid institutions were a key guarantee for investment, entrepreneurship and innovation. Initial policies to transform the economic structure have not always been successful. The first industrial policy, largely inspired by the prevailing orthodoxy in many developing countries in the 1960s, focused on import-substitution policies and failed to provide results. At that time, Mauritius had a very small internal market with low purchasing power. 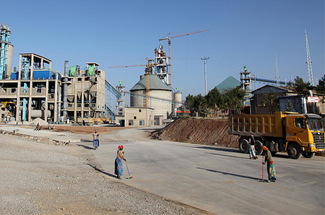 The cost of protection for inward-looking industries soon proved too high to be sustainable. Although never totally abandoned, inward-looking policies had to adapt to meet the ambitions and needs of the economy. Subsequently, following the trend in East Asia, Mauritius embraced an outward-oriented strategy: as a small island, markets abroad provided for economies of scale. The Export Processing Zone (EPZ) was set up. The positive lessons learnt from this first wave of industrialisation included the setting up of a Development Bank to support industrial development with incentives. In addition, it created a new breed of domestic entrepreneurs that managed to adapt to new opportunities and exposed the labour force to an industrial work environment. This was virtually inexistent before and would probably have taken time to develop. The EPZ needed quick wins in terms of labour flexibility as well as a business and financial environment in which it could easy gain competitiveness. There is more to the Mauritian story than just the setting up of an EPZ. At least two complementary policy choices and one external factor are important to highlight. 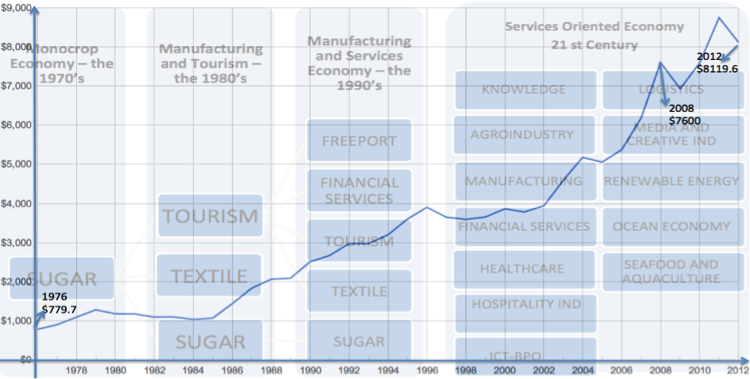 a) The heterodoxy of trade policy: Certainly during the 1970s but also mostly during the 1980s, Mauritius conducted a dual trade policy: open for exports and protective for import competing sectors. The export sector was a major driver of the economy and a key source of foreign exchange. It was therefore crucial to provide duty-free inputs and substantial tax incentives to encourage exports. Estimates show that during the 1970s and 1980s average rate of protection was among the highest: more than 100% in the 1980s and still as high as 65% at the beginning of the 1990s. To insulate local producers in the agro-business for instance, tariffs were quite high and in the agricultural sector, there was an extensive use of quantitative restrictions and import licensing. Most of those disappeared progressively when Mauritius joined the World Trade Organization (WTO) in 1995.
b) The role of exchange rate: Mauritius managed to keep a relatively high degree of currency undervaluation to keep exports competitive, often at the expense of imports. While the currency is pegged to a basket of currencies, it has deliberately been kept floating downwards. This, to some extent, compensated for increasing costs of domestic factors of production, although it was a double-edged sword, as it also inflated the value of imported inputs into the export sector. c) The wide use of access to main markets on preferential rates: Since the 1970s, Mauritius, together with other African, Caribbean and Pacific (ACP) countries, benefited from very favourable access to EU markets, in particular for its three star exports, sugar, tuna and textile products. For a long time, the rents from the margin of preferences allowed Mauritian exporters to have an edge over other potential competitors. Later on, it also significantly benefited from preferential access to the US market, through the Africa Growth and Opportunity Act (AGOA), in particular for the textile and clothing sector. Probably the result of its political system, whereby no singe political party ever managed to win elections without coalitions, policy making is built on the fundamental basis of seeking agreements, in particular between the private and the public sectors around key strategic issues. Private sector institutions occupy a central place in the policy making landscape to represent the voice of sector in the decision-making process. This has been instrumental in ensuring that government policies worked also in the interest of the business community and decisions were properly implemented. It ensured that the business environment remained indeed conducive as the economic trajectory evolved. This integrated approach towards industrialisation proved quite useful in navigating through transformation. Increasingly now, corporate social responsibility is becoming an important vehicle for private actors to participate in social transformation. Since 2009, government has established a policy with the overall objective of mandating registered companies to pay 2% of their book profit towards programmes that contribute to the social and environmental development of the country. For instance, some have stepped up efforts to support government’s programme in low-achieving schools, by providing lunch and school material to students. The current industrial sector, in particular the textile sector, has managed, over the past 25 years, to reabsorb the rising unemployment and to fuel the rest of the economy by providing opportunities for local entrepreneurs to build linkages outside the sector. But with time, the traditional textile-driven industrial sector showed its limits. Today, it remains a sector of low productivity, connected to the lower rung of the value chain. It did not manage to attract ideas and capture activities where the highest value is made. As labour costs increased over time, footloose companies got itchy feet and moved elsewhere. 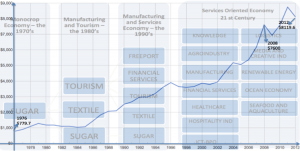 How can Mauritius manage its future growth trajectory? What now: How can Mauritius avoid the middle-income trap? While significant progress has been achieved in the last 40 years, global dynamics call for more and more reforms if Mauritius wants to avoid the middle-income trap and join the club of high-income countries. There are already indications of worrying signals: the average growth rate since 2010 has stabilised at less than 5%, necessary to enable incremental changes, but insufficient to steam up the engine to the next level. Beyond redesigning the economic landscape, some long-hanging reforms will have to be addressed. Three main weaknesses will have to be addressed. Today the education system remains one of the weakest points. While Mauritius has a 99% enrolment rate at the primary level, what comes next is very disappointing. Out of every 100 children who enter primary school, only 80 manage to pass their primary school exam to enter secondary school. Then, only 60 will manage to succeed after the first 3 years, 40 will pass the grade 5 exams only 20-30% will reach the end of the secondary school cycle. This clearly does not match the requirements of a high-income country. The curriculum is often criticized as being too academic with little openings for technical and vocational training. Additionally, labour market reforms still need to be completed to ensure flexibility. A diversified economic base only makes sense if it is possible for people to move across sectors. Currently, the stiffness of labour market and employment schemes that go with it still makes it difficult for people to move around. The basic principle should remain to protect people rather than jobs. Finally, Mauritius must step up efforts to plug into regional and global value chains. It must continue to build on the regional market and must upgrade its participation in global value chains, preferably by capturing activities with higher value added. Today, regional market penetration remains too weak: In 2013, a Study  estimated that Mauritius exports to the SADC region amounted to only 1.3% while its imports from the SADC region amounted to 2.5% in 2011. Similarly, the country has too big a bias towards its traditional markets in the EU and the US to export low value added products. Competition over concepts rather than over processes is necessary to have a meaningful role in GVCs. To achieve this, increased investment in innovation, research and development and technology is crucial. Economic transformation is a continuous process and Mauritius has had a good track record so far. The challenge for Mauritius however now lies in combining sustained domestic reforms with efforts required to keep up with international trends to become a global player. This is certainly going to be a rocky road, as it will have to count the presence of new emerging African middle-income countries that are increasingly catching up with their economic trajectory. It will only succeed if it manages to navigate through competition, turning challenges into potential opportunities. Isabelle Ramdoo is Deputy Programme Manager Economic Transformation Programme at ECDPM. This article was published in GREAT Insights Volume 3, Issue 5 (May 2014). 2. Tralac. 2013. An Analysis of SADC Free Trade Area.